Sooner or later a medical examiner will become involved in a shooting where an individual claims to have shot at another individual facing them but, at autopsy, the gunshot wound is found to be in the side or back. The question then arises as to whether the victim, on seeing the gun pointed towards them, or reacting to another outside stimulus, would have had sufficient time to turn 90 to 180 degrees in the time from when the shooter initiated the shooting process and the bullet hit. Cases such as this often involve police shootings. 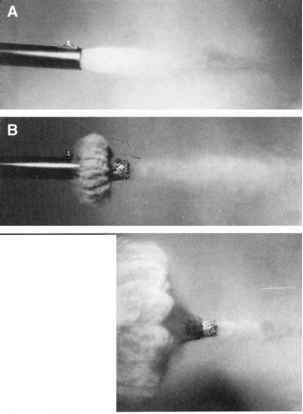 Tobin and Fackler measured the minimum time needed for police Officers to fire, on signal, a drawn handgun, pointed at a target.29 The tests were performed with both the trigger finger on the trigger as well as outside the trigger guard (the recommended way by many police agencies to hold a gun). The mean time from signal to firing the handgun was 0.365 seconds with the finger on the trigger and 0.677 seconds with the trigger finger outside the trigger guard. Volunteers were then videotaped as they turned their torsos 180 degrees as rapidly as possible. The mean time to turn the torso 90 degrees was 0.310 seconds while to turn 180 degrees it was 0.676 seconds. Thus, Tobin and Fackler concluded that if an individual was facing a shooter, it was possible for the individual to turn their torso and end up facing away from the shooter in the time from when the shooter decides to fire and the gun discharges. 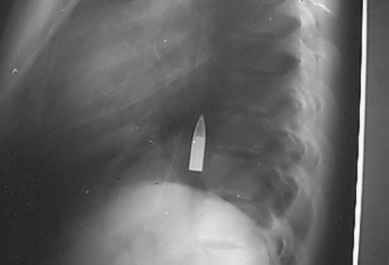 Figure 9.6 Full metal-jacketed .303 rifle bullet in lower thoracic aorta.